An article at John Piper’s Desiring God website promotes “Biblical” roles of husbands and wives in complementarianism, using Olympic pairs figure skating as an example of how the roles work together. The supremacy of the gospel. The joy of manhood, womanhood and doing things right in matters of the heart. The mission field created by abortion. Under Piper’s leadership, the group drafted a statement outlining what would become the definitive theological articulation of “complementarianism,” the biblically derived view that men and women are complementary, possessing equal dignity and worth as the image of God, and called to different roles that each glorify him. Church leaders who endorse complementarianism seem to use every opportunity to spread this teaching. It is deemed so important that some church groups including former Sovereign Grace Ministries president CJ Mahaney at one time had married couples sign that they were complementarians as part of the church membership covenant before they could become church members. Someone will have to let me know if this is still required for church membership. Following Piper’s logic, if you’re getting the Gospel wrong, then what does that essentially mean? Yesterday, I posted a link to the article by Ensor on the SSB Facebook page and the comments were very good. I thought they were so good, that I wanted to share them along with comments I saw elsewhere. Sochi is helping me be a better husband. And the Olympics are freshly making my wife to delight in her role as well. The surprising lesson is on display in figure skating pairs. At its best, this event displays the strength and beauty of unity: how two different people become one. The gold goes to that couple which has most mastered the skill of male leadership and female support making one glorious whole. He leads her onto the ice and initiates each part of their routine. She receives that leadership and trusts in his strength. His raw physical strength is more on display than hers; he does all the lifting, twirling and catching. She complements his strength with her own; a more diminutive and more attractive strength of beauty, grace, speed and balance. His focus as the head or leader is to magnifying her skills. Her focus is on following his lead and signaling her readiness to receive his next move. He takes responsibility for the two of them and she trusts his leadership and delights in it. The article is very short and it might be helpful to read it in order to understand the comments which I pulled from Facebook: here, here, and the SSB Facebook page here. How on Earth is this figured in the marital relationship? How exactly are bruises, cuts, and sores obtained by sharing the load equally according to each one’s strengths and talents rather than forcing each other into restrictive roles based on gender alone? Hahahahaha so hilarious that they used this as their model of great marriage—-many of the male figure skaters are gay. Watching the pairs figure skating last night, I asked my wife why the guy wasn’t 5’1″ and the gal 5’10” and doing all the throwing. Not to mention, many/most? 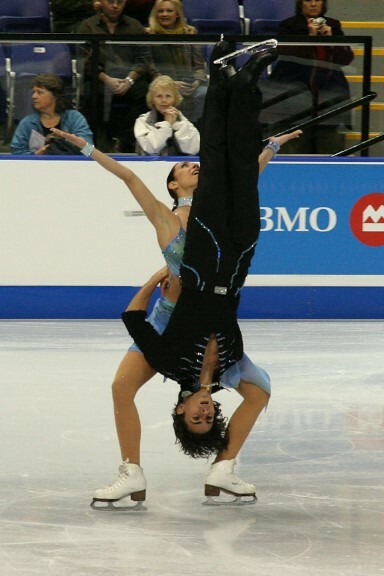 pairs skaters are not married to each other. How can they justify the intimate touching these pairs skaters exhibit? Doesn’t that go against their modesty rules/wimmins are evil tempters and must be modest shtick? not married couples in a skimpy costume putting hands in shocking places reserved for married couples…as they teach. Oh my gosh. This is so stupid. John Piper just does not know when to shut up. Has he seen the side by side jumps in the pairs event? Both the man and woman are supposed to do the exact same jump at the exact same time and will lose many points if they fail to do so. Same with the side by side spins. Sounds to me like an egalitarian sport. The footwork sequences that are supposed to be identical for hte man and woman. The lifts showcase both the man and woman. If the man has too much or not enough power for the throw jumps, the woman is more likely to fall or not complete the jump. On and on and on. Mr. Piper needs to stop reaching for senseless analogies to support his position where none exist.
. She complements his strength with her own; a more diminutive and more attractive strength of beauty, grace, speed and balance. It was the “diminutive” word that set me off. As a woman who towers over the majority of men, how would I ever “complement” his strength with that kind of stereotypical picture of a larger man and petite woman? The only time my frame has known “petite” was on the occasion of my birth – when I was born prematurely weighing in at 5 lb 13 oz. Just for clarification – – this is not Piper’s article, but it was posted on his Desiring God website. John Ensor is the author and it looks like he only wrote one other article for the website and if I recall, it was on a different topic. That’s what you get when you combine “Everything’s just an opportunity to Advance MY Agenda” with “grasping at straws”. These comps “see” things in their Bible I just do not see in the one I read. I truly believe God made men and women equal. For me it is just that simple. Says John Ensor who wrote the Olympic Lessons post. Except, of course, when you are daydreaming about using pairs figure skating as an example of biblical wimminshood and manzhood. Then you can ignore the above advice about modesty. I wish these folks would just admit they make up this biblical manhood and womanhood as they go. Diane – – -Girltalk – – -I just checked – that’s the blog site of CJ Mahaney’s wife and daughters. Yea, if their Sovereign Grace Ministries’ church had them sign covenants that they are on board with complementarianism in order to be members, they would surely endorse a guy like Ensor. Gak. I’ve been a contra/Irish set dancer for around 10 years. When I’m dancing in social settings a veteran woman will often ‘back-lead’ an inexperienced male dancer. This lets the man learn some of the basic footwork and timing without having to worry about starting patterns at the right time. Egalitarianism works. The glorious whitewashing of injuries in pursuit of the greater goal is written in the glib way of someone who never had one of those injuries or dealt with the aftermath. My worst athletic injury was caused by a beginner partner pulling my arm at a contra dance. My shoulder separated. It took 6 weeks of physical therapy before I could dress my upper body without searing pain. Honestly, there was no redeeming value from the injury for me. So does that article mean that Mark Driscoll is Tonya Harding? This is just down right embarrassing for DG. Let’s face it, it does not work if you have. say, Noel and John skating together. He is a teeny- tiny man. I am proud of the commenters especially the ones who pointed out the “team” aspect of this sport. I wasn’t even diminutive when I was born at 11 lbs. 3 oz. My poor 5′ 5″ mother! Now I’ve sprouted up to 5′ 7″ and more pounds than I should be carrying right now. Very interesting about experienced female dancers “back leading” an inexperienced male! oh God, how far will they go to desperately cling to their misogynistic little delusions? there is not one single part of this analogy that does not make me want to vomit, nor that holds up under scrutiny. it’s shakily constructed bs held together with chewing gum and string, and the worldview it implies is just revolting. not to mention toxic for people like me who do not fit in their claustrophobic little boxes. 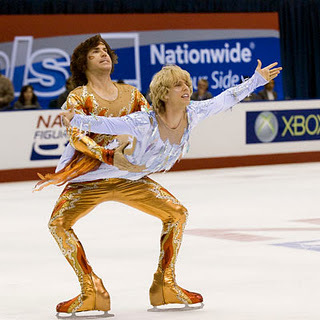 Two men figure skating together. I hope my image works. Sorry, but who is CBE? I wish you could have seen some of the things people sent me in my private e-mail today regarding this article. I was laughing so hard I was crying. Gag I cant believe people actually believe that nonsense. If I ask how you can get the gospel wrong and be saved, will I regret it? HAHA! Good point. We do off-topic all the time here and I loved your comment, Barnabasintraining! If he makes a mistake, she pays the larger physical price; he pays the larger emotional price. She falls, but he fails! This is incredibly disturbing. What kind of values does this communicate? His “success” is worth harm to her person? “She falls” is no where near as important as “he fails!”? The exclamation point is not on “she falls,” she gets hurt/harmed/damaged, it on the tragedy of his emotional wounds from failing. Not even emotional suffering from causing her suffering, but because “he fails!” I suppose she’s supposed to feel sorry for him that “he failed”? She has to teach him and endure his learning curve? So he’s the one in charge but she’s the one responsible? And she has to endure the consequences of his learning curve? This not only excuses, it virtually sanctions domestic abuse and the mentality that underlies it because it puts the emphasis and priority on his emotional state over his success and makes her bear the cost of that achievement. Not to mention it’s like Ephesians 5:25 in reverse even by their own interpretation! She’s got to do the self sacrifice, she’s got to do the teaching, and she’s got to do this for his sanctification! Sorry, this isn’t clear. I mean his emotional state about his success takes priority over her well being, not his emotional state is prioritized over his success. I fully endorse Christians for Biblical Equality. They have a statement of faith to which almost any Christian can agree, especially evangelicals, perhaps other than the complementarians. They publish a popular style magazine and an academic journal, and hold conferences. And the believe the Bible — just not some misogynistic interpretation of it. I have actually heard men say that if their wives would treat them, respond to them, talk to them, interact with them in a way that supports their manhood, THEN they would be able to respond to their wives in a Godly way. And yes, the men are supposed to be the leaders in the world of complementarianism. As a woman who has observed the comp world from the inside for some time, I have often come to the conclusion that many comp couples are led and directed by the wives. Some wives are behind the scene constantly directing the husband in his leading, because she isn’t supposed to be seen doing this. I’m talking about men in leadership roles in the church as well, not just men in their families. And some men don’t mind taking the bulk of the credit when it is given to them. It is really sad to me when Christian men and women cannot function according to their gifts because of the gender stipulations put on them. So many people are living a ‘pretend’ life to fit in to the comp culture. God’s gifts are being diminished. Eagle – Tonya Harding would make short work of Mark Driscoll. It’s not pairs figure skating, but my mind went immediately to a Dancing With the Stars some seasons back. In the group dance. Leila Ali (daughter of Muhammed Ali, & a fighter herslef) did a spectacular lift of Olympic speed skater Apolo Anton Ono. I’ve seen small children cause parents more difficulty. There must be a sermon in there somewhere……but Piper would surely have a conniptional fit over it. My impression of pairs skating has been that the woman is highlighted, and the man is there to support what she does, for the most part. Much like a pas de deux in ballet. The point that John Ensor missed is this: these are STONG women, both physically and emotionally. They have their families’ full support to train to become athletes. They are not kept at home and forced into only one “acceptable” role — they are allowed to chase their dreams and make sacrifices in other areas of their lives so they can excel in this area. They work the same days and same hours as their partners, sweating along the say. I don’t think the folks at DG will ever understand this kind of partnership. Because no girl born into this lifestyle would ever be allowed to compete at this level, or interact with a male in the manner necessary to make the pair succeed. She’d never be allowed to wear the costumes. And she’d never be permitted to accept the medals and applause for her work. They’d never allow her to be that equal with a man and be a woman that strong. SUCH a good point, tlc3!!!! Thanks for sharing that with us!! Excellent comment, TLC3! You sure nailed it. says it all . . . Yes, he was a she and she was a he!!!! Photoshopped image of a guy skater holding up a horse skater. The horse is wearing a purple, sparkley ice skate costume with skirt and a set of ice skates. If you are wondering, “Is this link worth clicking to see the photo?” 🙂 YES! It most certainly is. –Big Brown Makes Winter Olympic Debut–, on The Onion site. The page has photoshopped image of horse wearing ice skates and costume.